The Persuader is an extremely powerful human with, well developed personal combat skills. Enhanced Abilities: The Persuader has super human strength and endurance. 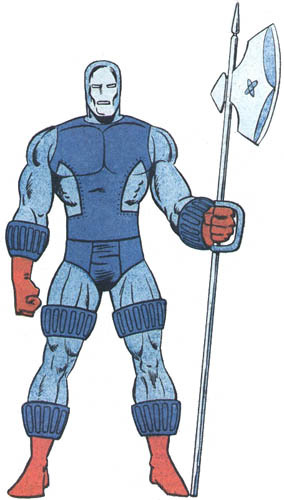 Atomic Axe: The Persuader wields an "atomic axe" on a long shaft, resembling a halberd. The axe can reportedly cut through anything, such as a person's air supply, the force of gravity, or the separation between dimensions, and follows the Persuader's mental commands. In the middle of the 30th Century, the Persuader began to acquire a reputation as one of the most powerful criminals operating within the United Planet’s sphere of influence. His crimes were generally variations of the ancient protection racket, or personal violence done under contract to another criminal or organisation. It is uncertain what his personal goals were, or what happened to the funds he acquired. At some point during this period he acquired the Atomic Axe, his principal weapon. Joining together with a group of the galaxy’s worst villains summoned by the Legion Of Super-Heroes to defeat the menacing Sun-Eater, he became a charter member of the Fatal Five.